The other day I realized we hadn’t picked up any holiday cards and there was no way I was going to attempt trekking to the store to dig through the discards. So I figured we could make some on our own, which brought to mind one of my favorite artist/illustrators – Barbara Garrison. You’ve probably seen her work without even realizing it when reading a book she’s illustrated to your child – or maybe one of the several she’s illustrated was a favorite during your childhood. Garrison creates her creations through making collographs, or by building and gluing different materials and items onto a base. The items are then rolled over with paint and pressed onto a paper. Additional paint can be added later to the dried print to add detail and dimension. Garrison artfully arranges bits and pieces of things together to create whimsical images that convey comfort, calm, happiness, and enjoyment. You can’t help looking at her creations and sighing just a little bit. Head on over and check out a few of her collographs for inspiration before getting started. I enlisted the tot in scouring our craft drawer for some small things we could piece together into a creative holiday card. I had a few foamy star stickers, string, felt, pipe cleaners, and a bunch of other stuff. Once I got them in a big pile, we started brainstorming ideas for the design. This is a great project for kids of all ages. Younger kids can help put together the design with adults assisting if a representational image is desired – or they can just have fun gluing away. The older set can sketch out an idea and cut, layer, and glue all on their own. And, you can create any kind of image perfect for using as a front for any kind of card – or just for fun! Start by cutting a base for creating the collograph. A piece of cardboard or tagboard works wonderfully. Your child can make the piece as big or small as she’d like. 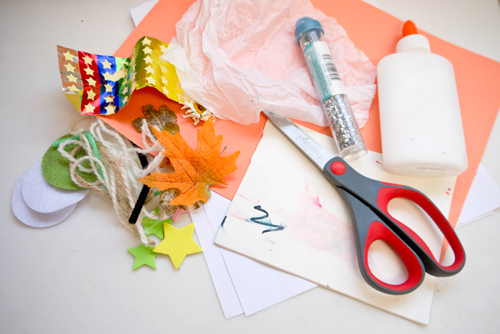 Now invite your child to arrange her selected items and see how things look before gluing anything down. Once she’s satisfied, offer her the glue bottle and let her squeeze and press away. Allow the finished creation to dry for several hours or over night. Once things are all nice and dry, cover your work area with a couple of sheets of newspaper or something else to protect from the potential mess. Squirt out some black paint and offer your child a foam roller or brush and invite her to gently roll or tap the paint all over the glued items. Once the prints are dry, your child can add touches of color or text as desired. 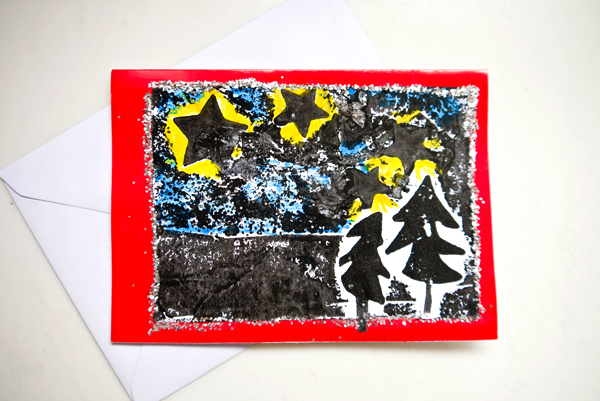 Cut out the collograph and glue onto the front of a card or pop into a frame! This looks like a fun project for a cold winter’s day, or, in my case, a warm rainy winter’s day. Very cute idea and I love the idea of using it for Christmas cards. I am new to your blog and loving it so much. I love your kid friendly creative activities. I am over at http://Facebook.com/experimentingmom Could not find your Facebook ID. Would love to follow you on FB. Please drop in a hi so I find your page!